The Red Baron a German/UK production with an international cast (two famous German actors, Matthias Schweighöfer (Schiller, Valkyrie) and Til Schweiger (King Arthur), and two British ones Lena Headey (300) and Joseph Fiennes (Shakespeare in Love, Enemy at the Gates) is a real guilty pleasure. I am aware that it took a lot of liberties with the historical facts. Especially in Germany it was highly criticized for being too glorifying. The Red Baron exists in two versions, an English and a German one, that are quite different. In the English version this sporting hunter mentality of the Baron is much more accentuated while it is toned done in the German version. This might explain why the reception in the UK was far better. This and the German´s obsession with historical accuracy when it comes to their own history. And, last but not least, it is more appealing to hear the German actors speak English than German. It takes the edge out of their voices. I am neither British nor German and just enjoyed this movie a great deal. A lot of gripping air combat scenes, an appealing cast, stunning cinematography and a great story. The movie depicts Baron von Richthofen as a tragic hero. And a very noble man. Maybe that is not what he was… I don’t know. He was certainly not as good-looking as the actor Matthias Schweighöfer. We see Baron von Richhofen´s early fascination with planes and flying. He is a rich aristocrat and once war breaks out it is only natural he should join the German airforce. To him the war is at first only a game, a sport. May the better one win. He is also capable of admiring others´, even British pilots´, exploits. It is only after quite a long time, and through the beautiful nurse Käte (Lena Headey), he falls in love with, that he realises that the war in the air and the war in the trenches fought by the common man are two completely different things. He also realises that he is mainly used for propaganda purposes. He is the most succesful German fighter pilot and a national hero. Germany facing defeat needs someone like him to look up to. His superiors want him for propaganda only; he should not fly anymore as this is much too dangerous. But The Red Baron loves nothing more than flying. And he does not want to be used. If your historical conscience will allow it, this movie is just something to enjoy. I truly like it and watched it more than once. We dont have many good air combat movies and even less that depict WWI. 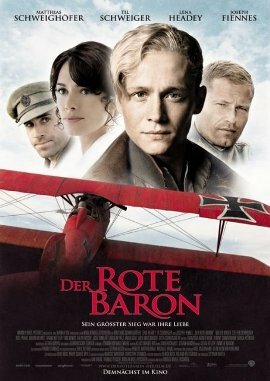 This entry was posted in Actors, Air Combat, Germany, Movie, Reviews, Trailer, True Story, War Movie, WWI and tagged Baron von Richthofen, Der rote Baron, GE/UK Movie, Germany during WWI, History, Joseph Fiennes, Lena Headey, Matthias Schweighöfer, Movie Trailer, Movies, Reviews, The Red Baron, Til Scchweiger, WWI. I would be interested in how you rank this movie and similar flicks like “Aces High”, “Von Richthofen and Brown”, “The Blue Max”, and “Flyboys”. I remember “Aces” fondly, but have not seen it in decades and have been unable to find a copy. From my readings, this movie does not seem to have gotten the personality of Richthofen right. I was under the impression that he enjoyed the “sport” of shooting down other human beings and cared very much about his kill total. I am sure they did not get him right at all. Even though we see that he liked the sport it is never said that he liked the kill. It is a very esthetical movie. All the actors are good-looking, the shots are perfect. Ranking is such a difficult thing. Let’s just assume you watch it for pure entertainment, the it get’s a 5/5. But is it good? Thinking on that line, it shouldn’t be rated higher than 4. On the other hand, sure, it doesn’t get the baron right, but it gets the nature of WWI and the difference of the war in the trenches and the war in the air right. The Blue Max is often said to be one of the very best, but personally I did not like it. Hearing a supposedly German speak English all the time… But that is me and my obsession with linguistic accuracy. I have never seen Aces High, will have to watch it. The Red Baron is definitely much better than Flyboys. I watched Flyboys and forgot it immediately afterwards. No forgetting The Red Baron. Finally finished it. It was certainly entertaining. Thanks for the recommendation. The aerial scenes were great. The love story was acceptable while probably very far from the truth. I would have to say they came close enough to his personality for me to not take issue. I like the way they left his death unclear since we still do not know how he died. The period touchs were nice and the trench scenes were an added plus. I will review it later and may be harsh on the historical accuracy, but it is certainly worth the viewing. I think I will do a Dueling Movies with “Fly Boys”. Should be an interesting match-up. That’s pretty much what I thought. Great entertainment. Historical accuracy wasn’t the main issue. I don’t think Flyboys was half as good. Entertaining but easily forgotten. From a cinematographic but of view The Red Baron is much better. I will see what you will come up with in your comparative review. I should probably re-watch Flyboys. How about comparing The Red Baron to The Blue Max? That has always said to be one of the most accurate ever. Good idea. I have not seen “The Blue Max” since I was a kid. I think I would prefer to compare it to “Aces High” if I can ever find it. Now that is a movie I haven’t seen yet. Will have to get it. I always thought it was WWII. Don’t know why. I thought it would be interesting to compare The Red Baron and The Blue Max as they are both from the German perspective and both WWI. I hardly ever have problems finding movies. But I tend to buy them. Is it because you’d rather watch them via Netflix? I have only one thing to say.Matthias was great in this role because he was rather close in looks to the real Baron.The Baron himself was a far better looking guy than is Matthias,..though he too is quite handsome. I think he was good for this role, I agree. I find it hard to judge how good looking the Baron was from those photos but, yes, maybe he was even better looking.